Origin and Habitat: Northern Argentina. Description: Cleistocactus ferrari is one of the morphological or geographical form of Cleistocactus smaragdiflorus distinguished from the type species for its lilac-pink flowers (mostly red in smaragdiflorus) and noticeably thinner end shorter central spines, but most botanist agree on the fact that all the varieties described until now should all be included in the Cleistocactus smaragdiflorus. The flowers are tubular tipped with emerald green and appear most heavily in spring and summer. 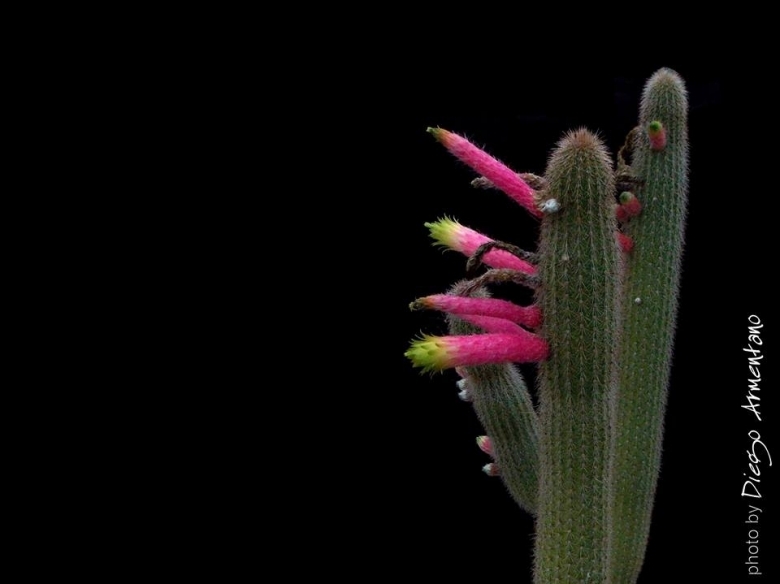 Cleistocactus ferrari belongs to a group of very easily flowered plants, decorative with pleasing appearance of stem and flower alike. Radial spines: 10-14, acicular, less than 10 mm long. Central spines: Similar to radials, yellowish to dark brown. Flowers: Small, 4 to 5 cm long, straight, tubular, a little constricted above the pericarpels, the tube and ovary liliac. Outer perianth-segments yellow, inner perianth-segments small, bright green to emerald green, acute to mucronate not spreading. Stamens included. Style slightly exserted. Stigma-lobes 5 to 8 green. 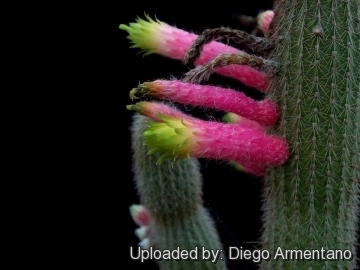 Cultivation and Propagation: Cleistocactus ferrari is a a much decorative hardy cactus.